The European Court of Human Rights on Thursday rejected the appeal of a German couple who have been fighting for years to home school their kids, saying the government was within its rights to temporarily remove their children. Home schooling is illegal in Germany and the Strasbourg, France-based court noted it had already upheld that law in previous decisions. But Dirk and Petra Wunderlich, who are in their early 50s, had argued their rights to privacy of home and family life were violated by Hesse state authorities when their four children were taken from them in 2013. They were returned three weeks later after the couple agreed to send them to school. In a unanimous decision, however, the court found that there was "relevant and sufficient reasons for the withdrawal of some parts of the parents' authority, and the temporary removal of the children from their family home." Robert Clarke, an attorney for the Alliance Defending Freedom, or ADF, a U.S.-based Christian legal advocacy group, who argued the Wunderlichs' case, said the Darmstadt couple was considering an appeal. "Petra and Dirk Wunderlich simply wanted to educate their children in line with their convictions and decided their home environment would be the best place for this," he said in a statement. The couple's children, whose names weren't released in line with privacy laws, are now 19, 18, 16 and 13. When the eldest reached school age in 2005, they refused to register her in a school, paying regulatory fines and accepting court decisions against them, but without changing their behavior. Between 2008 and 2011 they lived abroad with their children, and then returned to Germany. 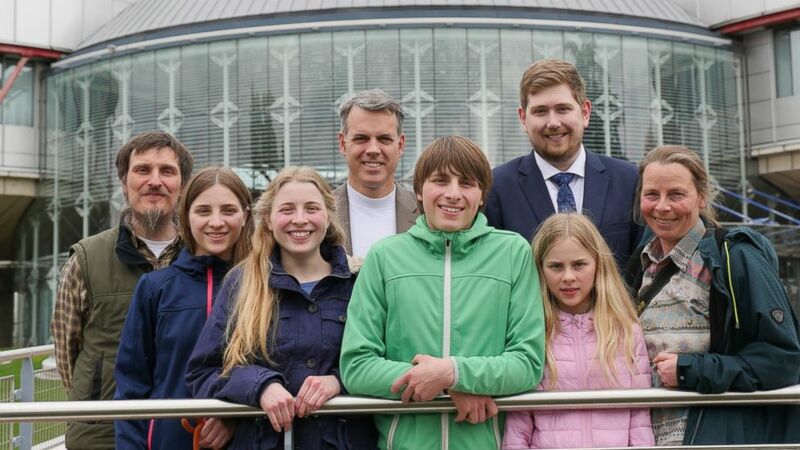 In 2012, the Darmstadt family court withdrew the Wunderlichs' right to determine their children's place of residence and right to take decisions on school matters and transferred those rights to the youth office. After appeals, the children were taken from them on Aug. 29, 2013, and placed into a children's home. They were returned Sept. 19, 2013, after they had been assessed and it was determined "the knowledge level of the children was not alarming" and the parents agreed to allow them to go to school. After they attended school for the year of 2013-2014 they were again taken out of the system, and the European court said Hesse state education officials have filed a criminal complaint against the parents for again failing to comply with the rules on compulsory school attendance. The court noted that at the time the children were taken from the couple, Dirk Wunderlich had made statements that "he considered children to be the 'property' of their parents" and that "on the information available at the time, the authorities reasonably assumed that the children were isolated, had no contact with anyone outside the family, and that a risk to their physical integrity existed." It added that the "actual removal of the children did not last any longer than necessary in the children's best interest, and was also not implemented in a way which was particularly harsh or exceptional." "The domestic authorities struck a proportionate balance between the best interests of the children and those of the applicants (parents), which did not fall outside the margin of appreciation granted to the domestic authorities," the court concluded. Dirk Wunderlich called it a "disheartening day for our family" in the statement from the ADF. "After years of legal struggles, this is extremely frustrating for us and our children," he said.